Last week I spent two days in a windowless conference room, discussing “inspirational leadership” in one-on-one meetings with 15 Taiwanese high-level male managers. It was a departure from my usual work with women leaders, to be sure. The fact that they are male leaders is coincidental; the opportunity to work with people interested in expanding their influence skills in a company invested in developing a strong leadership bench deepens my understanding of culture and human behavior in ways I never expect. I’ve been traveling to Hsinchu for three days every quarter for the past year now to work on this project. Hsinchu is an industrial city about an hour northwest of Taipei. The Hsinchu Science Technology and Industrial Park is home to more than 360 high-tech companies, and six universities bless the 40-square miles of this provincial city of less than half a million people. In this program, we spend one full day in a group learning session, and two more days in individual coaching with the participants. I had given the group the homework assignment to watch the 2009 movie, Invictus, directed by Clint Eastwood and starring Morgan Freeman and Matt Damon. The movie highlights the story of Nelson Mandela’s quest to unite South Africa through rugby, as the newly-elected post-apartheid president. I often use the movie as an example of John Kotter’s 8-step change model, as the story almost perfectly follows the sequence of stages outlined in the model. But more importantly, I love how the story highlights the importance of inspiration in changing people’s minds and behaviors. This is my favorite scene from the movie, and I use this clip to emphasize the need for inspiration in leadership to win people’s hearts and minds. 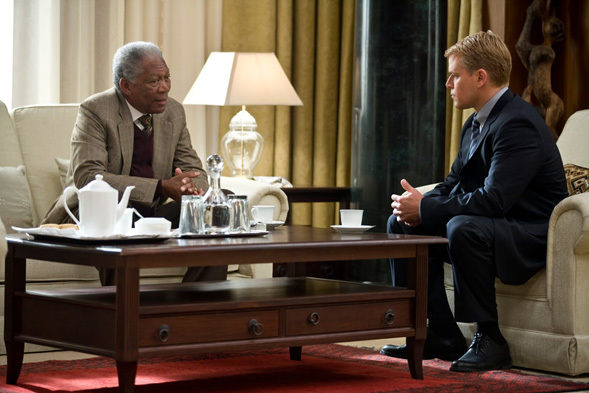 In the scene, President Nelson Mandela (Morgan Freeman) has invited François Pienaar (Matt Damon), the Springbok rugby team captain, for tea. In their conversation, Mandela references the poem, "Invictus" written by the English poet William Ernest Henley in 1875. Each time I’ve given this assignment, I take the time to watch the movie again, and I see something new in it with each viewing. I was really struck this time by the idea of borrowing inspiration from others—seeing others’ viewpoints through their writing, art, photography, movies, speeches, or even simple conversations, and sharing the emotions that later become catalysts to actions in our own lives. The idea that we can “borrow” some emotional energy—without depleting the source—is really quite amazing when you stop to think about it. There is an abundance of inspiration available to us, if we just allow it in. The truth is, sitting in a windowless conference room for two days talking about inspirational leadership with talented, creative individuals whose daily experiences are quite different from my own was actually quite inspiring for me. I understand very little about technology or the way it works, but I am eternally grateful that it works. Every person’s story—what they know, what they do, how they see the world—has value for us, especially when it’s different from our own. Borrowing from the work of others for inspiration is really quite easy. In a way, it’s like opening a window for fresh air, but instead, opening your mind to new ideas. It’s all out there if you look, listen, and take it in.